"Kentucky bourbon gives a kick to this Southern classic." 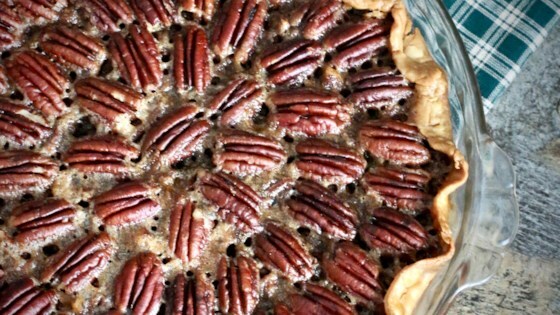 This pecan pie is overwhelmed by the bourbon and chocolate and has more of a custard consistency. Recipe almost makes enough filling for 2 pies if using a frozen 9" pie shell. I would push my grandma down the stairs to get to the last piece of this pie. DEELISH! The pie was delicious. The only problem I ran into was that the recipie makes a lot of filling -- I used a frozen, ready-made 9" pie crust and it was enough for 2 pies! I tried this recipe without the bourbon and it turned out to be rather good.